CRE-sources | STILES TENANT PROJECT MANAGEMENT: Creating Environments That Work. 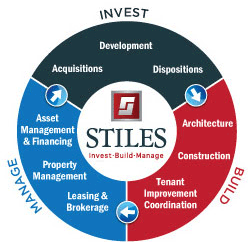 STILES TENANT PROJECT MANAGEMENT: Creating Environments That Work. Established in 1951, Stiles is recognized for developing more than 37 million square feet of quality office, industrial, retail, mixed-use and residential projects throughout Florida. With a multitude of award winning projects, Stiles has played a vital role in South Florida’s rise to prominence. We are proudly credited with inspiring the revitalization of downtown Fort Lauderdale, including helping to shape the city’s iconic skyline. Stiles’ long-standing commitment to excellence, unsurpassed performance and personalized service that is unmatched throughout the industry has earned the Company our extensive list of distinguished repeat clients, including Wayne Huizenga, City Furniture, Guggenheim and the Tribune Company. These strategic relationships continue to enable Stiles to play a vital role in Florida’s economy and grow our business throughout the state. In addition, our financial strength and “human capital” have allowed us to build long-term relationships with major U.S. lenders such as BBVA Compass Bank (NYSE: BBV), Bank of America Corporation (NYSE: BAC), Wells Fargo & Company (NYSE: WFC), and JP Morgan Chase & Company (NYSE: JPM). In addition to our Ft. Lauderdale headquarters, we maintain regional offices in Miami, Tampa, West Palm Beach, Naples, Ft. Myers and Orlando, Florida.